When I was a child, my mother filled our family life with celebrations. Each holiday included festive decorations, special desserts, and holiday-themed dinnerware. From Valentine’s Day to St. Patrick’s Day to the 4th of July, each holiday was a cause for reverie and remembrance. But my mother, who passed from this earth seven years ago, would have been outraged by a manufactured holiday known as Abortion Provider Appreciation Day. 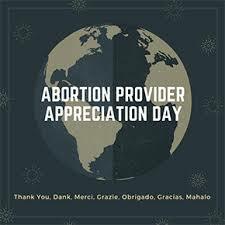 Sunday, March 10th, according to the abortion industry, was a day set aside this year to ”thank” abortionists. This is an insult not only to my late mother, but to mothers around the nation. Mothers such as my friend Carla, who experienced profound grief at the death of her child to abortion. Mothers such as my friend Arlene, who lost her only child, a boy, to an abortionist’s lethal act. Abortion, the death of a defenseless unborn child, a cause for celebration? How warped. Abortion is ever and always the violent taking of an innocent life. It not only destroys one life but often leads to profound emotional pain for a mother, who must come to terms with her child’s senseless death. The fact that Abortion Provider Appreciation Day occurred on a Sunday, the day people of faith honor the Creator, seems especially revolting. But that could be just another way to poke a finger in the eye of pro-lifers. Abortion continues to take a tremendous toll on our nation. An estimated 61 million preborn children have perished since 1973, when the U.S. Supreme Court legalized abortion nationwide as a result of the ruling known as Roe v. Wade. We are poorer as a nation because we’ve been depleted of our most important resource—our people. Each day, we lose thousands more to the whirr of a suction machine and the clink of an abortionist’s deadly instruments. But we are also poorer ethically, morally, and spiritually. It is long since high time we say “no thank you” to the abortion industry and its practitioners and its apologists in Congress. Let’s respond to Abortion Provider Appreciation Day by redoubling our efforts to pass meaningful pro-life legislation…to educate the public about the harsh reality of abortion…and saying an earnest prayer that the nation’s abortionists will have a change of heart. This is more than just a greeting card moment. This is a historic opportunity to reclaim America for life!